These Transformer Stations are particularly suitable for outdoor installation. 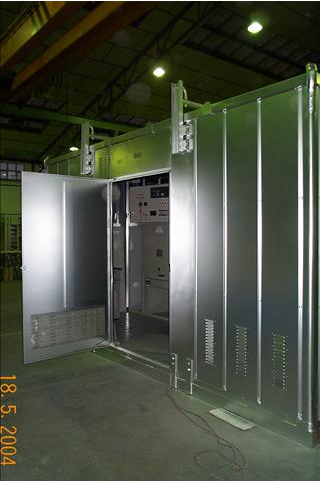 They can house all kind of electrical distribution switchgear, fitting the requirements of the Power Distribution Utilities, as well as any type of electrical distribution switchboards of M.V or L.V required in a factory. They are designed in various appropriate containing equipment with or without service corridor measures . The centers are manufactured with all equipment installed inside , tested so that the entire assembly is transported to the point of final placement . The center is thermally insulated with varying degrees of protection. The center is thermally insulated with varying degrees of protection. They can have air conditioning, pressurization, fire detection and extinguishing , overpressure device , etc. The standard degree of protection is IP54 , being able to provide more demanding grades on request .